In response to recent events, interfaith leaders from the Las Cruces community offered an opportunity for community members to unite their voices in thoughtful prayer and reflection on Friday, February 3rd. The interfaith leaders who organized this gathering were Bishop Oscar Cantu, Pastor Jared Carson of Peace Lutheran Church, Rabbi Larry Karol of Temple Beth-El, and Radwan Jallad of the Islamic Center of Las Cruces. They said they hoped to reaffirm our belief that the United States can and should be a nation that welcomes people seeking opportunity and individuals and families who are hoping to find refuge here from conflict and challenges in their home countries. The interfaith leaders issued a joint statement at a press conference prior to the prayer service. Click here to read. A few months ago we conducted a parish survey through the Center for Applied Research in the Apostolate (CARA). We are happy to share the results are in! A representative from CARA was at the Newman Center on Sunday, October 18th to share the results of the survey. Watch her presentation at right. You can also read the Full Report here. Children 5 years old- 5th grade welcome! Wow, what a response! Both sessions of VBS are now full. We're looking forward to seeing you all in June! At Cave Quest, kids explore what it means to follow Jesus through dark times. Kids participate in memorable Bible-learning activities, sing catchy songs, play teamwork-building games, make and dig into yummy treats, experience one-of-a-kind Bible adventures, collect Bible Memory Buddies to remind them of Jesus’ love, and test out Sciencey-Fun Gizmos they’ll take home and play with all summer long. Plus, kids will learn to look for evidence of God all around them through something called God Sightings. Each day concludes with a Cave Quest Closing that gets everyone involved in living what they’ve learned. Family members and friends are encouraged to join in daily for this special time at 11:30. ​Graduating seniors from all area high schools are invited for a special blessing on Wednesday, May 18th at the 5:30pm Mass. Cake & punch reception after. During the Year of Mercy, young adults from churches in our diocese will be going out every third Saturday of the month to do a corporal work of mercy. For more info or to RSVP please contact Roberta at 505-795-9464. ​For three days, February 22-24 at 7pm, we will have the opportunity to embrace our Lenten journey in a special way with a mission led by a guest priest, Fr. Thomas R. McCarthy, O.S.A. The mission will focus on the Sacraments, the Treasures of Our Faith. Where do you feel comfortable and welcome? Why did Jesus like to party so much? Do you know who the lost member of the Trinity is? What do bowling shoes have to do with Confirmation? These questions and many more will be pondered and hopefully answered Monday night. Will you be there to find the answers or will you miss out and wonder forever? The Newman parish food pantry has experienced a 40-50% increase in the number of families we serve and we expect even more families to come in need as the holiday seasons approach. Your donations are especially crucial and very much appreciated. During November, we particularly need canned vegetables and cake mixes. Please give your donations to the ushers or bring them to the office. Thank you for your generosity! There is much excitement regarding Pope Francis’ visit to Ciudad Juarez and the Mass he will be celebrating on February 17th. Many people are asking for tickets to the Papal Mass. Unfortunately, there is limited seating for the Mass and Diocese of Ciudad Juarez was unable to provide Papal Mass tickets to the Diocese of Las Cruces. The Diocese of Ciudad Juarez is the official distributor of the Mass tickets. These tickets are NOT for sale. Offers to purchase tickets for the Mass are scams, do not purchase these tickets. For more information on the Papal visit please visit the diocesan website here. Let's send our love and support to our parish's seminarians, Ivan, Francis, and Franky for St. Valentine's Day. Bring your Valentine cards (or other notes of support/encouragement) and your baked goods to the office by Feb 8th. The care package will be mailed on that day. Because space in the box is limited, please make sure your Valentine goodies fit into a quart-sized zip lock bag. Thank you! Hate the feeling of cold feet during these winter months? Our friends at Camp Hope do too! Many of the residents at the tent city have few options for keeping their feet dry and warm, especially with extreme temperatures. Donate clean, warm socks through the first weekend in February, after weekend Masses or to the office during the week. Thank you for your help! We would like to thank all of you who donated to the Baby Bottle Almsgiving Project. You collected $3,722.96 for our organization. This helps tremendously in meeting our mission: “Promoting God’s design for cherishing life. Our mission is to serve Dona Ana County by providing STD and pregnancy tests, limited sonograms, peer options counseling, male mentoring, and parent education.” Thank you! Thank you to all who contributed to the December effort! Soon our seminarians will be back at seminary for another semester. Let us show them our support by sending messages with blessings and encouragement. Our first annual Trunk-or-Treat, organized by the parish youth group, the 'God Squad,' was a huge success! In celebration of All Saints Day, children were able to go fishing in St. Peter's Pond, decorate cookies in St. Martha's Bakery, share about the Saint they dressed up as, and go trunk-or-treating in the church parking lot. Many thanks to all the families who helped their children dress up and learn about their Saint. A big thanks to everyone who decorated a trunk for the children to visit. Congratulations to the trunk decorating contest winners: Becky Hernandez with Way Out West, Mona Chip & Campus Ministry students with the Popemobile, Settles Family with the Gates of Heaven, and the Sanders Family with the Pirates of the Caribbean. "I urgently appeal for a new dialogue about how we are shaping the future of our planet..."
What is the message in Pope Francis's new encyclical, Laudato Si? How does it affect how I live my life? The Newman Social Ministry group is offering a series of group discussions for anyone interested in reading and sharing the encyclical. There will be three sessions this fall: Thursdays from 6-7pm (Oct 29, Nov 5 & Nov 12). You are invited to come to the day that works best for you to explore Pope Francis's message on the care of our Earth. Copies of Laudato Si' are available in the parish gift shop or online here. Questions? Email Barb Creider. Cooked and served by students, proceeds from Lunch Bunch on Monday, November 9th support the NMSU Tough Enough to Wear Pink campaign. All resident and student parishioners are invited- starting donation of $2 for students and $4 for non-students requested. Lunch is served from 11:15am-1pm. Thanks for partnering with us in raising breast cancer awareness and funds for research! Click here to learn more about NMSU Tough Enough to Wear Pink. 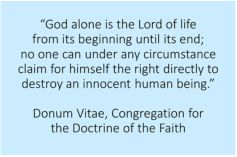 This weekly Mass will be offered for continued respect for all human life from conception to natural death. ​For more information on outreach or prayerful vigil, contact Mark Cavaliere at 40daysforlife.com/lascruces. Prayerful Vigil opportunities daily from 6am-10pm on the public sidewalk in front of Whole Woman’s Health (3900 E. Lohman Ave.). Newman parishioners are especially invited to participate on Fridays. Newman is joining in the NMSU Tough Enough to Wear Pink activities with a prayer vigil to honor and remember all those living with, surviving, and taken by breast cancer. All students, faculty, staff and friends are welcome on Wednesday, October 21st at 7pm at the NMSU Duck Pond. Do you have a specific person you would like us to keep in prayer? Students will be at the Masses on October 17th & 18th to take your prayer intentions. Meet us on campus Thursday nights at 7pm for our new Theology of the Body series. We'll be in Corbett Center Room 104, the conference room in the new Aggie Lounge. Topics include "God's Eternal Plan of Love," "For Freedom Christ Has Set Us Free: Exploring what Freedom Is," and "Sexual Morality & the Freedom to Love: The 'Why' Behind the 'What' of Catholic Teaching." Gather with your #NMSUCatholic community for a weekend of prayer, reflection, recreation & Mass at Holy Cross Retreat Center. SOS--Support Our Seminarians. One of our seminarians, Francis, said that it takes a parish to grow a seminarian. Our parish now has three young men, Ivan, Jeff, and Francis, in Trinity Seminary in Irving, TX. All three are NMSU graduates and were Newman parishioners. Our prayers have helped form them. We would like to continue to tell them we are still praying for them and support them. Each month, we will send them a Care Package with goodies and prayers. For October, we would like to send home baked cookies and cards with prayers and a personal note of support. Please bring your baked goods (packaged ready for mailing), or your notes or palanca letters to the office by Wednesday, Oct. 21 and we will make sure they are included in this month's Care package. Thank you for your support. Newman is joining in the on-campus annual community service celebration that takes place in the fall before the week of Homecoming. Projects include, cleaning, painting, and picking up trash on the NMSU campus. Students, alumni, faculty and staff welcome! Come join us for Mass under the stars at White Sands! Take this opportunity to relax and enjoy God's beautiful creation. Mass will start at about 7pm. Dinner will be provided for student parishioners before Mass. Resident parishioners, feel free to bring your own picnic basket. Meet us at White Sands, follow the signs to the group use area. You can also find a map to Group Use Are here. Come join us for Mass under the stars at White Sands! Take this opportunity to relax and enjoy God's beautiful creation. Mass will start Friday, October 16th at about 7pm. Dinner will be provided for student parishioners before Mass. Resident parishioners, feel free to bring your own picnic basket. Meet us at White Sands, follow the signs to the group use area. You can also find a map to Group Use Are here. Join Campus Ministry to Keep State Great! Newman is joining in 'Keep State Great,' the on-campus annual community service celebration that takes place in the fall before the week of Homecoming. Students, alumni, faculty and staff are invited to participate on Saturday, October 17th from 9am-12pm. Projects include, cleaning, painting, and picking up trash on the NMSU campus. Email Mona to sign up. Join Us for Our Annual Parish BBQ! ​​Food, music, and kids games! Be sure to buy your raffle ticket to support our parish and for a chance to win great prizes! Participate in Pope Francis's Visit to the U.S. Most of us are not able to join Pope Francis on the East Coast when he visits the U.S. September 22nd-27th, but we can still participate! On Thursday, September 24th at 7am, we will be hosting a watch party of the Pope's address to Congress in the parish hall. Breakfast will be provided for students but everyone is welcome to attend. The U.S. Bishops Conference offers more ways for us to participate from afar, including going on a "Virtual Pilgrimage" and following the Pope's journey on an interactive map. Click here for details. Our Campus Ministry staff and students are partnering with the United States Conference of Catholic Bishops (USCCB), Catholic Extension, and the Catholic Apostolate Center to host a national conference for college students June 16-21st at NMSU. Campus Ministry Leadership Institute (CMLI) is a training and working institute that gathers student leaders and campus ministers from across the nation for five days of team building, project development, and networking. Grounded in the U.S. Bishops' pastoral letter, Empowered by the Spirit, the Institute is designed to form leaders who work collaboratively to develop and implement successful Catholic Campus Ministry programs on public and private college campuses. We are expecting over 90 student leaders and campus ministers from Ohio, Pennsylvania, New York, Colorado, and California. In addition to their conference time on the NMSU campus, conference participants will visit local attractions, specifically White Sands National Monument. Thanks from the VBS Crew! During VBS, Kids went on an exciting, icy expedition to the slopes of Mount Everest where they discovered they can conquer challenges with God’s mighty power! It was an adventure that helped everyone involved begin or grow in their relationship with God! Thank you to our volunteers who made this possible during the week. A special, heartfelt THANK YOU to all who donated to our VBS program this week! We appreciate your support! And be sure to check out pictures from our week here! Please join Fr. Ray and our parish staff in praying for the communities of Holy Cross Catholic Church and Calvary Baptist Church affected by explosions August 2, 2015. As of August 3rd, 10:30am, the investigation at Holy Cross has concluded and vehicles may be picked up from the parking lot. The Holy Cross parish office will remain closed August 3rd. Our Mass and parish office schedule at Newman will continue as normal this week. Thank you for your prayers and support. May God continue to bless you in your generosity.